The x-axis and y-axis Remembered! The x-axis is a horizontal line and the y-axis is a vertical line. I'm sure you've heard that a million times, but it might hard for you to remember which one is which. Can you hear the "rhymes?" x to the left and y to the sky. All the time students ask about "Where can I buy research paper?" - I advise them this company website. Use these tricks to help your remember which axis is which. Once you know them using these clues, you'll never forget them again! Reminder: the x-axis really runs left and right, and the y-axis runs up and down. Notice the arrows at the ends of the blue and purple lines? Those indicate the lines go on forever. So even though we only show the coordinates going up to values of 10, they can be extended as large (or small) as you want. Want to impress your teacher? Share this trick with her and then she can tell the whole class. With your help, everyone will undestand the x-axis and y-axis. The x-axis and y-axis are simply just two intersections number lines. In the grid above, we can plot points and graph lines or curves. 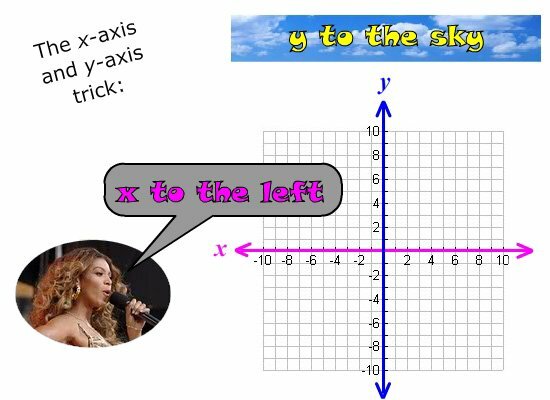 Hopefully these little rhymes will help you to remember the correct directions for the x-axis and y-axis. Are you interested in finding out about the slope or y-intercept of a line that is graphed in the coordinate plane? How about our explanation of the coordinate plane through Disney's Pirates of the Caribbean? Don't miss it. Return to other free algebra help topics or visit the GradeA homepage for more free math help resources.